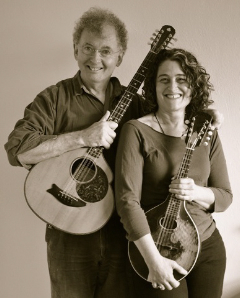 Jimmy Crowley and Marla Fibish are a unique and compelling duo in the world of Irish music. Jimmy, the bard of Cork, has been a central figure in the Irish folk scene since the enthusiastic reception of his debut album The Boys of Fairhill in 1977. 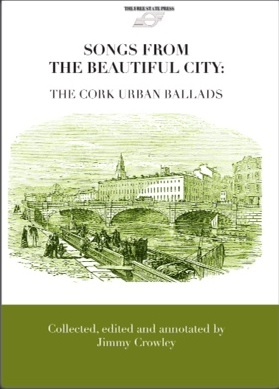 He is well known for singlehandedly focusing well-deserved attention on the songs of Cork City at that critical time in the folk revival. Jimmy is also a brilliant song-writer, writing new music that has now entered the body of great music to come out of Cork. Marla is a San Francisco native and a long-time feature of the Bay Area Irish music scene. She is known for her uniquely vibrant and driving playing on mandolin — an instrument not always associated with dynamic playing! They joined forces in 2010, on one of Jimmy’s rare trips to the bay area. They launched a CD together – The Morning Star — in April 2011, unlike any other, featuring Irish music played only on double strung instruments — mandolin, mandola, bouzouki, mandocello, and Dordan– a big bass bouzouki. Jimmy and Marla are a compelling combination in performance. Their sound evolves from their shared love for the mandolin-family instruments. They take delight in the playful dialogue between their instruments, filled with happy harmonies, frivolous fills and colorful counterpoint. Jimmy sings from his extensive song repertoire and Marla pulls out her favorite jigs, reels, and party pieces to deliver a sparkling variety of traditional music, songs, stories and good humor. Lots more information, including sample tracks from Marla and Jimmy’s CD at www.marlafibish.com.